Americans routinely use words like “broke” or “poor” to describe why we can’t go out with friends, take a vacation or buy a new car. We’ve coined the hashtag of “#FirstWorldProblems” to describe many of our daily trials and tribulations. We are spoiled. India—or more accurately, Taj Mahal—was on our short list of “must visit” places in Asia during our time in Japan. An easy 10-hour flight from Tokyo, it was more accessible than ever. But you can’t fly 10 hours to see just one thing, so we looked for help crafting the perfect itinerary. In the end, we chose Intrepid Travel‘s Delhi to Kathmandu, Nepal trip. 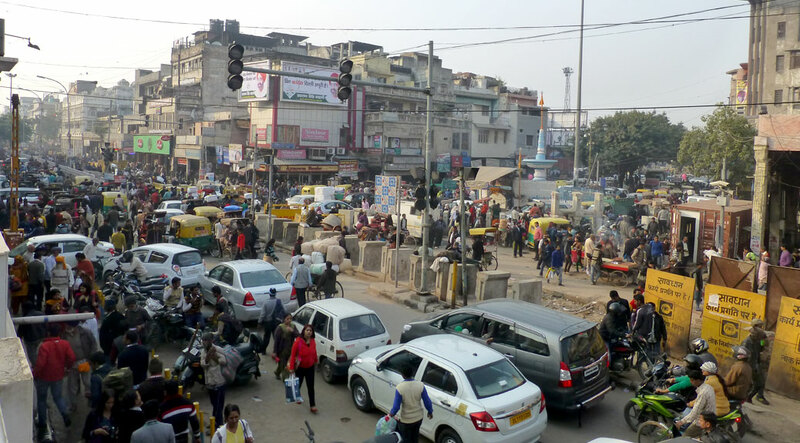 Our trip began in India’s capital city of Delhi. Before arriving in Delhi, phrases like “developing nation” and “extreme poverty” were buzzwords on Sunday morning political shows or keywords in a college thesis. But they weren’t real. They didn’t have faces. Aside from well-known landmarks like Taj Mahal or the Ganges River, the reality of India is largely ambiguous in the minds of most Americans, myself included. India is an emerging power on the geopolitical landscape. It is a large landmass in the center of an unstable part of the world with an increasingly wealthy upperclass. As such, it’s an important national security ally of the United States in the fight against terrorism. It’s battling China for the title of world’s most populous country with more than 1.2 billion inhabitants. 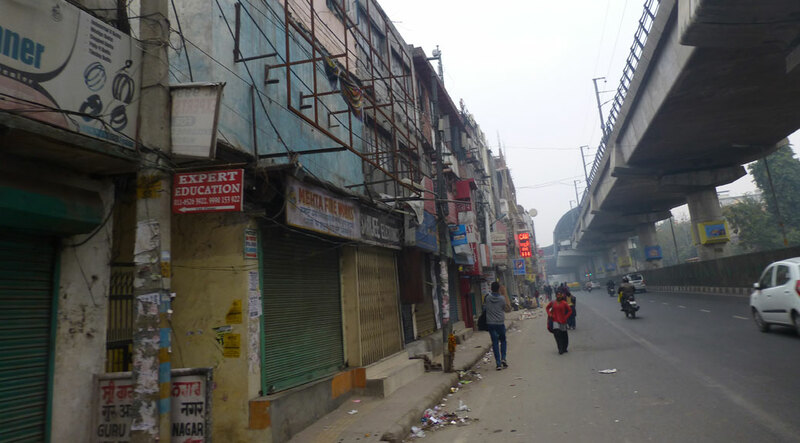 A main street in Central Delhi. Shopkeepers clean up the sidewalks as best they can, but the trash will pile up again throughout the day. But it’s also a country with considerable poverty. Poverty unlike anything that exists in the U.S. and certainly unlike anything I’ve seen firsthand until now. According to World Bank, India has the largest concentration of impoverished people in the world. 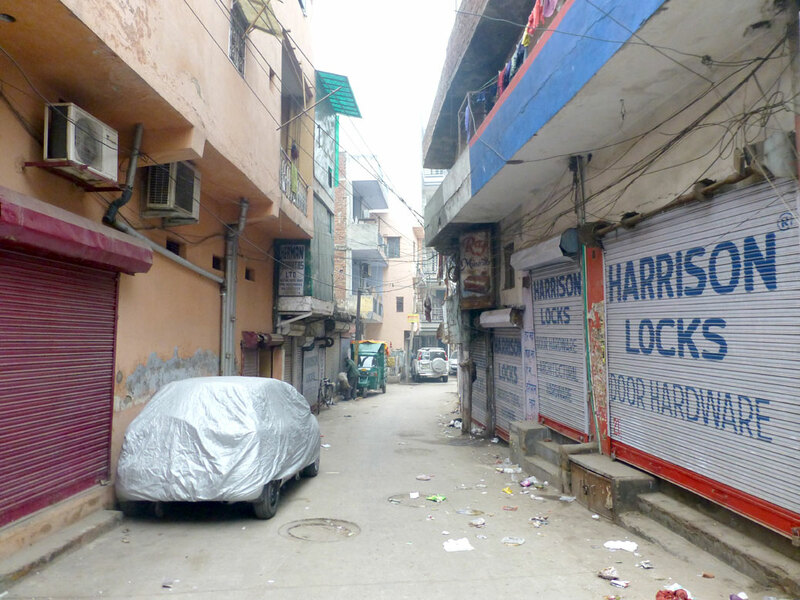 Delhi alone is home to 22 million people in an urban area the size of Jacksonville, FL. New construction dots the city, but not fast enough to replace crumbling residential buildings and spotty infrastructure. As tourists, we’re discouraged from giving handouts of food or money. There’s a larger strategy at play to quell the national poverty problem. But try ignoring a toothless grin from an elderly lady at the train station or the children, undernourished and dressed in dirty rags, wading through traffic begging for change from passersby who drive a new Audi or Mercedes-Benz. These aren’t the guys in a Columbia jacket standing on the freeway ramp with a “Why lie, I need a beer” sign. This is real, life-and-death stuff and it’s heartbreaking. Government propaganda encourages a “green” Delhi, yet trash piles up in the streets. An editorial in The Times of India newspaper claimed (with tongue firmly planted in cheek) that throwing trash in the street is part of the national identity. The government is also encouraging the use of toilets instead of doing business in the open. Since October 2014, a government program has provided more than 500,000 toilets in homes across the country, but is fighting a perception that indoor toilets are unhygienic. Yet, in a situation that seems unresolvable, India is trying to move forward. The country was still buzzing from President Obama’s visit the week before we arrived. When we told people we were from America, they’d reply with a big grin and say “Obama!” More importantly, they see that the U.S. finally understands the seriousness of India’s successful development. Today’s India is a country breaking free of an imperial past. Despite its ancient history, it’s only been independent from the British since 1947. It’s a country resetting the expectations imposed by a caste system that determines a person’s lot in life simply by the family they’re born into. There’s unprecedented access to education, yet many are still not participating, young women in particular. My goal is that this is the last of the “book report” posts about India… our travels through the country were amazing, inspiring and enlightening. But, to present India only through the lens of its natural beauty is to do a disservice to the realities facing its people and the efforts of those who have literally given their lives in the development of the nation (Mahatma Gandhi and his daughter-in-law Indira Gandhi to name a few). Much like Dhaka, Bangladesh’s capital city. It’s the most densely populated city in the world – 115,000 people per square mile. It’s hard for Americans to comprehend this kind of crowding, with its attendant poverty, pollution, noise, and traffic. One day it took us 2 1/2 hours to travel 2 miles by car. I swore I’d never complain about American traffic jams again.